Surprisingly, choosing the best nursery flooring is probably one of the more difficult decisions you will need to make during the baby nursery design process. Due to an increased awareness of such health hazards as allergens and toxic VOC emissions, things have become somewhat more complicated. What to put on the nursery floor is one of the hot topics of the day among soon to be parents. Before we get to the many options available, however, you have a decision to make. Stick with what you have or make a change? Making The Most Of The Flooring You Have. Factors To Consider When Choosing New Flooring For Your Nursery. Accessories For Your Nursery Floor. If your baby turns out to be susceptible to allergies, you may have no choice but to remove the nursery carpet later on. Make sure you have them thoroughly steam cleaned before baby arrives. Avoid steam-cleaning carpets in winter, when you can't open windows, and on very humid days during the summer. Vacuum the nursery carpet regularly after baby arrives. Cover old carpets with large, easy to clean nursery rugs made with natural fibers. For more information about keeping your nursery carpet clean and safe, click here. Make sure you give the floor a good clean to remove any dust. Fill in any slits, gouges or gaps where yucky stuff can gather. Then cover the wood with a large, washable nursery rug with non-slip backing - baby needs a soft place to land. Make sure you seal off the room while sanding to prevent dust from polluting the air in your home. Vacuum all dust from the baby nursery afterwards and wipe everything in the room with a damp cloth. You may need to repeat this process several times until there is no more dust. Consistent with the overall style you have chosen for your baby nursery. Pine or oak wooden flooring will fit well with a cottage style nursery. Light laminate or bamboo flooring will bring out the best in a modern style. Carpeted floors work well in a traditional baby room. Wooden nursery floors with a distressed painted finish will help to pull a beach style nursery together. 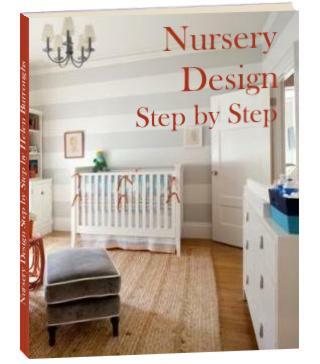 Read more about nursery decorating styles here. Free of as many allergens and emissions as possible. Babies absorb far more air born chemicals than adults through their very delicate skins. Their under-developed digestive and respiratory systems are prone to the effects of allergens, for example, asthma and eczema. It won't be long before your cuddly bundle becomes a dynamite package of squirming mischief. Crawling babies get into everything, touch everything and put everything in their mouths, including the germs they pick up from the baby nursery flooring. Babies, vomit, wee, poo and spill milk at random. There will be messes on the nursery floor. Babies fall, bump and tumble no matter how carefully you watch them. Often straight onto their faces or heads - a fall on a hard floor can really hurt! Babies are startled by loud noises such as footsteps on hard floors and are easily awakened. Warm for baby (and mom) to crawl and play on. You don't want a cold nursery floor to interrupt your fun! Replacing flooring is an expensive exercise - make sure you get your money's worth. Baby will not be a baby forever, and the decor scheme in the room is likely to change fairly often through your child's young life. Unless you can afford to replace the floor when baby grows out of the nursery, choose a floor finish or color that will adapt with the decor in the room. Your main baby nursery flooring options fall into three categories. Soft, soft-ish and hard. In the soft category your options are nursery carpet and ummm... carpet. Despite the fact that nursery carpet off-gasses dangerous toxins and harbors dust-mites, it is still one of the most popular floor coverings for a baby nursery. It has the advantage of being soft, warm and noise absorbent. Three very important qualities of a cozy nursery floor. Find out more about nursery carpet here. In the soft-ish category you have cork and natural linoleum. Experts refer to these as cushioned, resilient flooring types. (Not soft-ish - that's my word!) They are easy to keep dust-free and are virtually toxin-free. Therefore, they represent a good alternative to the traditional nursery carpet. Vinyl has many advantages, including being easy to clean, easy to install and inexpensive. However, once installed, vinyl may off-gas potentially harmful compounds (including lead, cadmium and phthalate plasticizers) for years. During my research, the only absolutely unanimous opinion on baby nursery flooring that I could find, was that vinyl is a really bad idea. In the hard category, you have a few more options. Find detailed information about wood, cork, bamboo and natural linoleum nursery floorings here. The earlier you have your new baby nursery flooring installed, the better. The removal of old flooring, whether wooden or carpet, kicks up all sorts of dust and toxins into the air. These need time to disperse before baby comes along. Don't despair. There is a healthy carpeting option. Although not at the top of the experts' safe list, natural fiber carpeting is considered to be safe for your baby nursery if you keep it clean. So you will be able to roll around all over the floor with your precious bundle after all! Read more about healthy organic baby nursery flooring options here. Your nursery floor can pose a safety risk to your baby for two main reasons. 1. All babies fall over - often and usually flat on their noses. Minimize the risk of injury by making sure that the nursery floor is not slippery and that baby has a soft place to land. Carpet and cork and natural linoleum achieve both of these objectives. If you have chosen one of the hard baby nursery flooring options, make use of large, easy to clean nursery rugs. To ensure baby's safety all rugs should have a non-slip backing, preferably made of natural rubber. 2. All babies put everything in their mouths. Minimize the risk of baby picking up yucky germs from the nursery floor by cleaning or vacuuming it regularly. It can be difficult to thoroughly clean a messy spill from a carpeted floor. To avoid this problem, make use of large, easy to clean nursery rugs here too. If baby messes on the rug, chuck it in the washing machine. Voila - problem solved. Obviously, your least expensive baby nursery flooring option is to stick with what you have. Dress up your old flooring with a new washable area rug, and your budget remains intact. Whichever option you decide upon, make sure that the flooring you choose is durable. Flooring of any kind is a long-term investment - the longer it lasts, the more value for your money. If you have decided to replace your current nursery flooring, cork, natural linoleum and vinyl (not recommended) are less expensive than wood or wall-to-wall carpeting and can be installed DIY. If you would like a wooden nursery floor, laminate flooring is the least expensive and is easy to install DIY, saving you more money. Last but not least, let's not forget about area rugs for the baby nursery. They afford a simple, relatively inexpensive way to transform your baby nursery from one look to another, much the same as a nursery bedding set. There are literally hundreds to choose from. Different styles, shapes, colors, textures and prices. For our favorites visit our Nursery Room Rugs Store. Finding baby stores with a decent selection of nursery rugs is easier said than done. And when you do find them, most stock the same old stuff. But I've managed to find a couple of real gems. So no need to go off surfing all over the internet!